Whoopi Goldberg: Military Widows Love 15 Minutes in Spotlight-Fiction! - Truth or Fiction? Whoopi Goldberg: Military Widows Love 15 Minutes in Spotlight-Fiction! Whoopi Goldberg said on “The View” that military widows love getting their 15 minutes in the spotlight after a rousing ovation for the widow of fallen Navy SEAL William “Ryan” Owens during President Trump’s State of the Union Address. 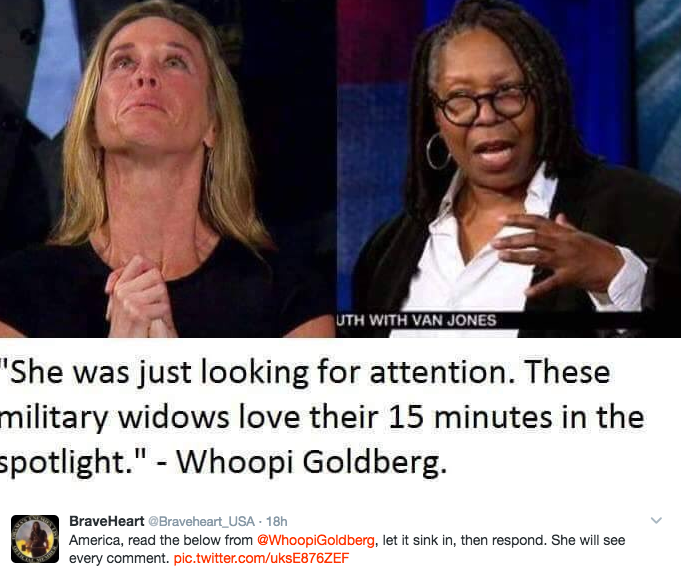 A fake news website is behind false reports that Whoopi Goldberg said military widows love their 15 minutes in the spotlight. Whoopi Goldberg is in hot water after comments she made Wednesday regarding the Navy SEAL widow that was honored last night during President Donald Trump’s historical speech. After last night’s demonstration where several democrats in leadership roles refused to stand while the widow was being honored, Goldberg continues to make the point that liberals lack a significant amount of class. The controversy played out after fallen Navy SEAL Ryan Owens’ wife, Carryn Owens, received a two-minute long standing ovation during President Trump’s State of the Union Address. Trump had received criticism for authorizing the raid on suspected terrorist compound in Yemen that claimed Owens’ life in the days leading up to his address. Critics argued that the raid was poorly planned and resulted in no useful intelligence. Trump said during the address that the raid had, in fact, resulted in valuable intelligence. In the end, reports that Whoopi Goldberg said military widows always love 15 minutes of fame are fiction. They were started by a website that confuses faked news for satire. Whoop Goldberg’s alleged quote on military widows loving 15 minutes of fame started on a fake news website. 7-year-old Girl Gets Breast Implants-Fiction! Valerie Jarret Moves into the Obamas' DC Home-Unproven!